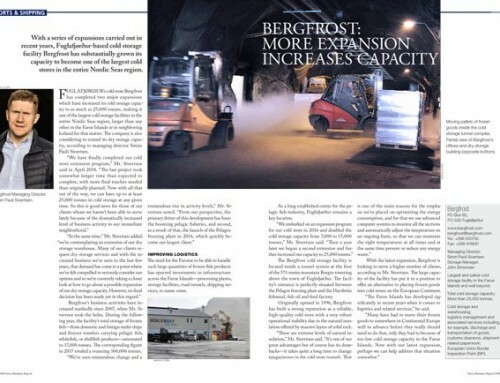 Home to a thriving pelagic and whitefish industry, the Port of Tvøroyri continues to develop additional services to secure its place as a seafood processing hub — meanwhile with incoming tourism seen to offer future potential. 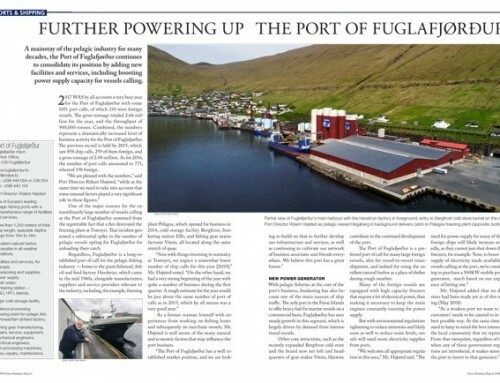 These are busy times for the Port of Tvøroyri, where Varðin, the largest player in the Faroese pelagic fishing industry, set up an advanced freezing plant five years ago in collaboration with local whitefish processor Delta Seafood. 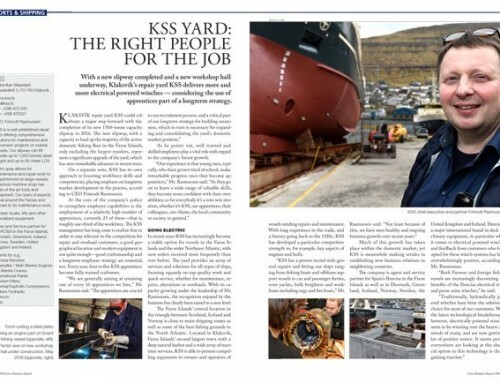 The enterprise has effected a boom on port business with ship traffic increased and a growing number of service providers entering the scene. To accommodate the needs and requirements of the fish industry, the port authority has made a series of investments in the last few years, recently adding a new deepwater terminal at the Fishing Harbour as well as developing a new storage area nearby, and the surrounding road infrastructure has likewise been extended and strengthened. Newly launched services focus on convenience and comfort as well as raising safety and security levels, Port Director Jón Bogi Guttesen explained. One example is the offering of free internet access to all port clients. Also the port has fitted an anemometer to enable vessels calling at the port to automatically receive updated information on the status of harbor conditions. In another example, local water supply has been modernized and extended to meet the high standards of quality and quantity demanded by the seafood processing industry. 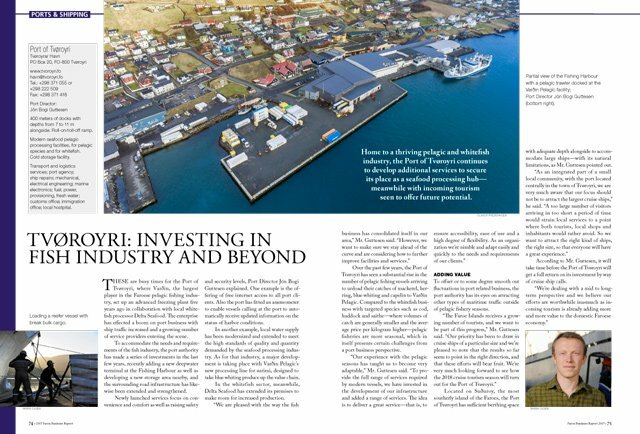 As for that industry, a major development is taking place with Varðin Pelagic’s new processing line for surimi, designed to take blue whiting produce up the value chain. In the whitefish sector, meanwhile, Delta Seafood has extended its premises to make room for increased production. Over the past few years, the Port of Tvøroyri has seen a substantial rise in the number of pelagic fishing vessels arriving to unload their catches of mackerel, herring, blue whiting and capelin to Varðin Pelagic. Compared to the whitefish business with targeted species such as cod, haddock and saithe—where volumes of catch are generally smaller and the average price per kilogram higher—pelagic fisheries are more seasonal, which in itself presents certain challenges from a port business perspective. 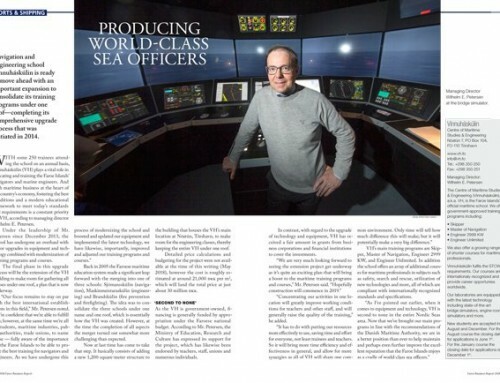 To offset or to some degree smooth out fluctuations in port related business, the port authority has its eyes on attracting other types of maritime traffic outside of pelagic fishery seasons. 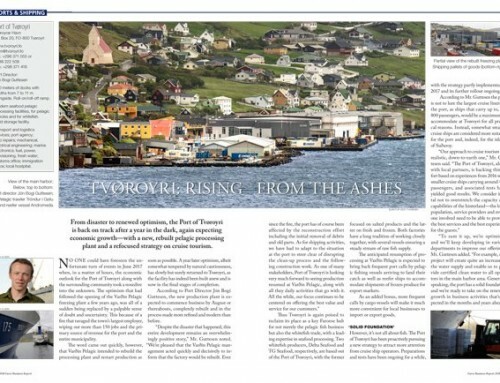 Located on Suðuroy, the most southerly island of the Faroes, the Port of Tvøroyri has sufficient berthing space with adequate depth alongside to accommodate large ships—with its natural limitations, as Mr. Guttesen pointed out. According to Mr. Guttesen, it will take time before the Port of Tvøroyri will get a full return on its investment by way of cruise ship calls.